Master Manjunath: His real name is Manjunath Nayaker, but he's better known as Master Manjunath who immortalized RK Narayan's character Swamy in the hit series Malgudi Days. This child actor began acting at the tender age of three and has several Hindi and Kannada movies to his credit. Master Manjunath also played the young Vijay Deenanath Chauhan in the original Agneepath. But he is perhaps best remembered for his role in Swami and Friends which won him many awards. He quit acting at the age of 19 to concentrate on his studies. He did MA in Sociology, Diploma in cinematography and CA Foundation course. He is working as a Vice President - PR and Liaison for the Bangalore-Mysore Infrastructure Corridor Project (BMIC). Master Manjunath: His real name is Manjunath Nayaker, but he’s better known as Master Manjunath who immortalized RK Narayan’s character Swamy in the hit series Malgudi Days. This child actor began acting at the tender age of three and has several Hindi and Kannada movies to his credit. Master Manjunath also played the young Vijay Deenanath Chauhan in the original Agneepath. But he is perhaps best remembered for his role in Swami and Friends which won him many awards. He quit acting at the age of 19 to concentrate on his studies. He did MA in Sociology, Diploma in cinematography and CA Foundation course. He is working as a Vice President - PR and Liaison for the Bangalore-Mysore Infrastructure Corridor Project (BMIC). Sunny Singh: Remember the small naughty kid from one of the most celebrated show, Dekh Bhai Dekh? Yes! That is Sunny Singh, the child actor who played Sameer (Shekhar Suman) and Sunita's (Bhavna Balsawar) son in the show. The little toddler is no more the cute little naughty boy, but has grown up into a handsome hunk. Sunny, in fact, had recently debuted in Bollywood with Shahid Kapoor's film Paathshaala. 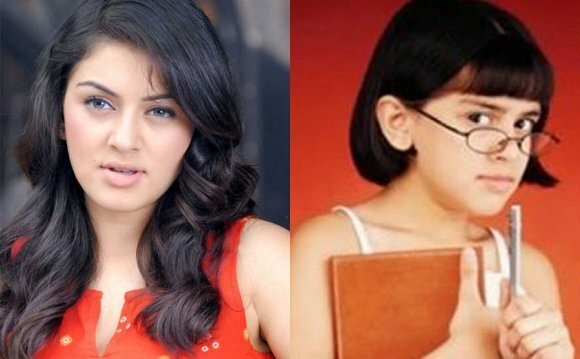 Karishma Acharya: Now that we have noticed the little prodigy Sunny Singh from Dekh Bhai Dekh, let's take a look at the little angel who played Vishal's sister on the show. Vishal's little sister, Abha played by Karishma Acharya, is now a successful costume designer and fashion stylist based out of Mumbai. Karishma found her calling in fashion designing instead of acting. Ajay Nagrath: Remember the adorable Chintu from the evergreen comedy fiction show Shrimaan Shrimati starring Reema Lagoo and late actor Jatin Kanakia, alongside Archana Puran Singh and Rakesh Bedi? We are sure you will not recognize him, as the chubby kid has lost a lot of weight. Ajay Nagrath is now very slim and was also seen in Biggest Loser Jeetega. He did a number of TV shows after Shrimaan Shrimati and is currently giving comic relief to viewers in India's longest running TV show CID. Tanvi Hegde: Remember the Frooty and Tooty from Star Plus' Son Pari, starring Mrunal Kulkarni? The sweet little actress has acted in many movies like Gaja Gamini, Champion, Rahul, Isha, Pitaah, Durga, Muniya (Rudra's daughter), Viruddh... Family Comes First, Vaah! Life Ho Toh Aisi!, Chal Chalein. Besides this, did you know that Tanvi has been a part of more than 150 commercials? Jhanak Shukla: Jhanak Shukla, the cute little blue-eyed girl is the daughter of renowned actress Supriya Shukla. The little star entertained one and all in the Hindi remake of an American show by the name Little Wonder. Currently she is pursuing her studies and was recently seen in Channel V's Gumraah- The end of innocence. It might come a surprise that she had been signed for a pivotal role in Sanjay Leela Bhansali's movie Black. However she refused since it would have taken too much time.